When an artist incorporates a found object in their work, in any medium, they are fusing together the past and the future, they are taking something old and overlooked and giving it renewed meaning and new life. For many artists, the memories inherent in the object itself join with their own memories to give their art meaning. 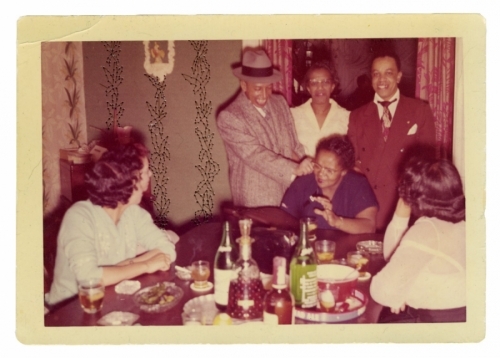 In a series called Found, Brenna K. Murphy uses her own hair stitched into found photographs to create memories of home. She had a transient childhood, moving eight times by the time she was eighteen, and she developed new ways to imagine a home for herself, through her creativity and through the familiarity of her own body. Her art reflects a nostalgia for a home she never knew. Other people’s photographs of holidays and family gatherings, neat front yards and walls lined with family photos become hers, in a very physical, tactile way as she sews patterns into them with strands of her own hair. 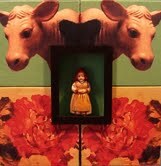 She appropriates the memories of others, and they become new and unexpected as she weaves a part of herself into them. Maralyn Wilson uses found objects to tell stories in sculptural form. The creativity required to see something old and discarded in a new light forges a tie to her own youth, when her “imagination had no boundaries.” She expresses a childlike joy in creating a physical object and of telling a story with it, and her stories, imbued with memories and a deep sense of the past, come to life as something solid, exciting and new. Alice Sprintzen uses found objects to take traditional jewelry making techniques to unconventional places. For her, found objects reflect past experiences but gain new meaning in the hands of the jeweler. “The castaway is elevated to a place of honor, the mundane becomes precious and materials rusted, worn by age and discarded, are valued for their intrinsic beauty.” Her work is a reflection on the wastefulness of consumer culture, a celebration of invention, and a recognition that the ordinary can become beautiful given the right attention. Brian Patrick Adams is a mixed-media painter who uses found objects and collage techniques to tell old stories using new methods. He draws upon tales that are part of our collective history--myths, historical narratives and religious fables--and he reinterprets them and makes us look at them from a new angle. His work is literally layered with meaning. The found objects in his paintings have significance for us because of associations we’ve formed with them throughout our lives, but his presentation is so rich and surprising that we interpret them anew in the context of his work. In painting, photography, jewelry or sculpture, artists give found objects a future, waking their memories of the past and joining them with their own to create a new story.